Radial Split Casing Design. Casing is close grain iron of 30,000 PSI minimum tensile strength. Back pull-out design eliminates the need to disturb piping should the pump ever require service in addition the casing stays in the line. Centerline discharge. Stud mounted casing assures positive alignment and allows rotation of discharge to eight different positions. Openings are also provided for test gauges, for venting and for draining the pump. Enclosed Bronze Impeller. Enclosed bronze impeller is of latest hydraulic design for maximum effi ciency. It is balanced for vibration free operation. Precision fit to shaft and double-locked with key and cap screw. Mechanical Shaft Seal. Mechanical Shaft Seal is self-adjusting for temperatures up to 225 °F (107 °C) and pressures to 150 psi (1034 kpa). Has ceramic seat and carbon seal faces for long trouble-free service. Special seals are available for higher temperatures and fluids other than water. Tapped opening is provided in the seal chamber for flushing seal faces. Coupling Guard. Furnished on all complete Base-Mounted units manufactured by Burks Pumps. Not furnished with purchase of pump only, but required. Replaceable casing wear ring is especially relevant. Prevents wear on casing and is easy to replace. Gasketed Bronze Sleeve. Gasketed Bronze Sleeve on either GNB and GNC power frames protects the shaft against wear and corrosion. Shaft on GNA power frame in #316 Stainless Steel. Bearings. Grease lubricated ball bearings provide two years minimum service at maximum load. Average bearing life is five times minimum. Wide bearing spacing provides solid shaft support. Oil Seals. Protect both bearings. Convenient Relubrication. Tapped and plugged openings are conveniently located for easy relubrication of power frame. Factory Tested. 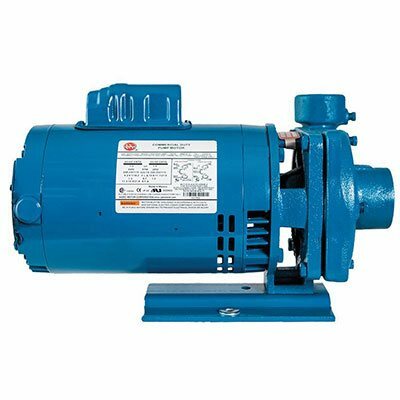 After careful assembly and inspection, EVERY pump is factory, hence, no worries and will meet Hydraulic Institute standards. Temperatures To 500 °F (260 °C). 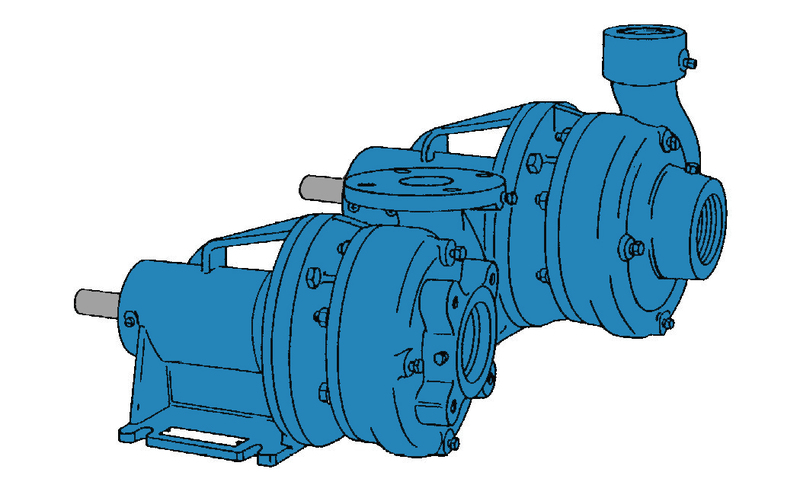 All models, with the exception of the GNA7-21/2 and all GN9 series pumps are available in a Jacketed Seal Cavity design thus for pumping hot oil, hot water and heat transfer fluids in common use in high temperature heating or cooling applications. This feature furthermore greatly extends seal life in high temperature applications. To order, add suffix MJ to pump catalog number for temperatures below 400°F (204°C) and add suffix MJK as a result to pump catalog number for temperatures over 400 °F (204 °C). Example: GNA5-11/2MJ. See Section on High Temperature Pumps in conclusion for more information.